Unity Ads generates revenue by displaying paid advertisements in your game. The more traffic and impressions) your game creates, the more money you can earn. Unity Ads facilitates different campaign types with different billing points (for example, completed views, clicks, or installs), and always selects the highest-earning campaign to display to your users. The average eCPM for Unity Ads depends on many factors, such as platform, region, player demographics, and in-game placements. The biggest factor is the number of players engaging in your game. Our Monetization statistics article contains detailed information on important terminology, and tips for understanding your metrics. Our Best practices guide provides design-driven insights for maximizing your revenue. Our Revenue and payment article provides a comprehensive guide to earning revenue and getting paid. 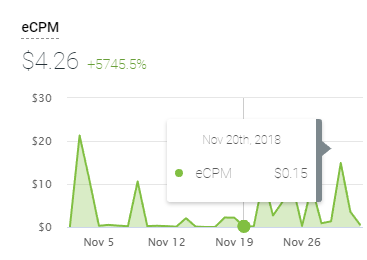 Quote: The average eCPM for Unity Ads ranges from $6 - $12. It can be as high as $20 in English speaking countries, or as low as $3 in non-English speaking countries. Revenue is based on the quality of impressions. "Unity Ads ranges for $6 to 12" Is that per hour, per day, per week, month, year? "So for example, 1000 impressions from a single country could earn you $6." Does that mean that, in order to earn 6$, 1,000 "impressions" must be made in one country only? will I get 6$ for the impressions made in the USA and 0$ for the ones made in France? 1000 isn't a limit and isn't a minimum. It means that you earn $6 per 1000 impressions. If you have 500 impressions you earn $3. I'd like the reiterate that these figures are not set in stone- it varies country to country, for example. Revenue is generated based on a combination of views, clicks, and installs. There's no "one unified way" of pre-calculating the revenue generated by your game, as we run a wide variety of campaigns on our platform. What if my game is just show the ads (no user interaction on the ads) but I will adjust the camera on the ads (direct/indirect) to let user view on the ads. Can I still have the revenue from unity ads by using this way? Rewarded Ads are being used for me but it is fluctuating like crazy, I have above 5,000 impressions (7.6k).